Robert is a Professional Newbury based magician, mind-reader and Demonstrator of Extra-Sensory Curiosities, and works regularly at Newbury Manor. He entertains with demonstrations of sleight of hand, memory feats, psychological reading and hypnotic suggestion. His natural wit creates an exciting, fresh, lively and intellectually stimulating genre of entertainment. Perfect for creating a talking point at any event! Robert is the recommended magician and mind reader for Newbury Manor, one of the top venues for corporate events and weddings not just in Berkshire, but the whole of the UK. Newbury Manor is a great venue, only a couple of minutes away from Junction 12 on the M4 (so easy access from London and the rest of the country); however, it is located close to the West Berkshire town of Newbury, and about 30 minutes drive from the centre of Reading. These facilities are perfect for corporate events, hospitality and training; as well as weddings and private parties. There are a range of rooms, from small conference rooms through to large function rooms. 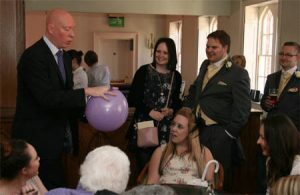 Robert can entertain a small group with close-up magic, through to entertaining a whole room of delegates with his full cabaret mind-reading show which geared towards the corporate market. 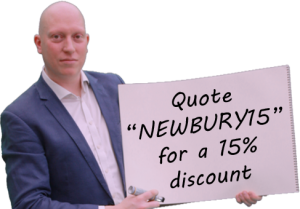 Remember to quote “NEWBURY15” when booking Robert for your event at Newbury Manor for a 15% discount from his standard package options. Contact Robert now to discuss how he can make your event a magical occasion. 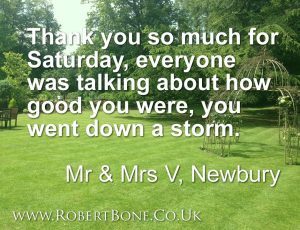 Email robert@robertbone.co.uk or call direct on 07930 420 257, remembering to quote “NEWBURY15” for your 15% discount.